What is Carnitor (Levocarnitine) used for? Carnitor-500 (Levocarnitine) is a vitamin-like substance, which regulates metabolic processes in human body. It is normally indicated to patients, suffering from the diseases, accompanied by loss of appetite and, consequently, by such symptoms as exhaustion and weight loss, and in the cases of both psychological and physical reasons of exhaustion. It may help normalize metabolic processes in patients with anorexia and neurasthenia, as well as gastritis and pancreatitis with secretory deficiency. Carnitor (Levocarnitine) can be prescribed to treat pediatric patients, starting from the newborn period; to treat infants with the decreased food reflex, resulting in undernutrition and underdevelopment of the child; to treat hypotrophy, arterial hypotension, and adynamy in children; in cases when a child experienced asphyxia or was exposed to a birth injury; in cases when nursing a premature baby is necessary; to treat children when they undergo hemodialysis; and to treat metabolic disorders in children in case of obesity and growth delays. Carnitor (Levocarnitine) is recommended in the therapy of skin diseases, such as psoriasis, dermatitis, scleroderma, and lupus erythematosus; to patients with heart disorders, such as heart attack, angina, and ischemic cardiopathy; as a medical product to support energy levels in vigorous physical activities and to increase body endurance; and in case of cerebral circulation disorders. How should I use Carnitor (Levocarnitine)? The regular daily demand for vitamin B11 is 300mg, however with sports activities it increases up to 1,000-2,000mg, depending on the person`s weight. This dosage is split into 2-3 doses a day. The duration of the treatment usually ranges between 4 and 6 weeks, followed by a 2-week break. However, both the dosage and the duration of treatment have to be prescribed by a physician or a nutrition specialist. What are the side effects of Carnitor (Levocarnitine)? Treatment with Carnitor (Levocarnitine) may cause side effects, such as allergic reactions; abdominal pain; and dyspeptic disorders. 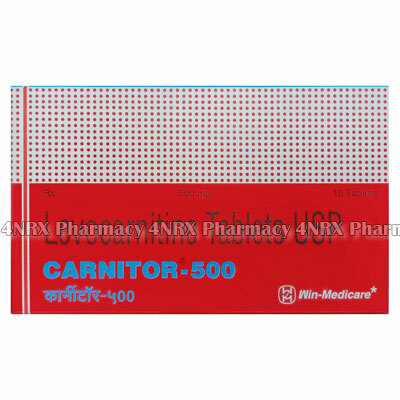 In case a patient suffers from uremia, Carnitor (Levocarnitine) may lead to muscle weakness. Under any circumstances, in case of any adverse events related to the treatment with any medical product make sure to consult with your physician, who will make a decision on whether it is reasonable to keep on taking the medication. Carnitor (Levocarnitine) should not be taken by patients who are hypersensitive to the active ingredient or to any other components of the medical products. Another contraindication to Carnitor (Levocarnitine) is trimethylaminuria.